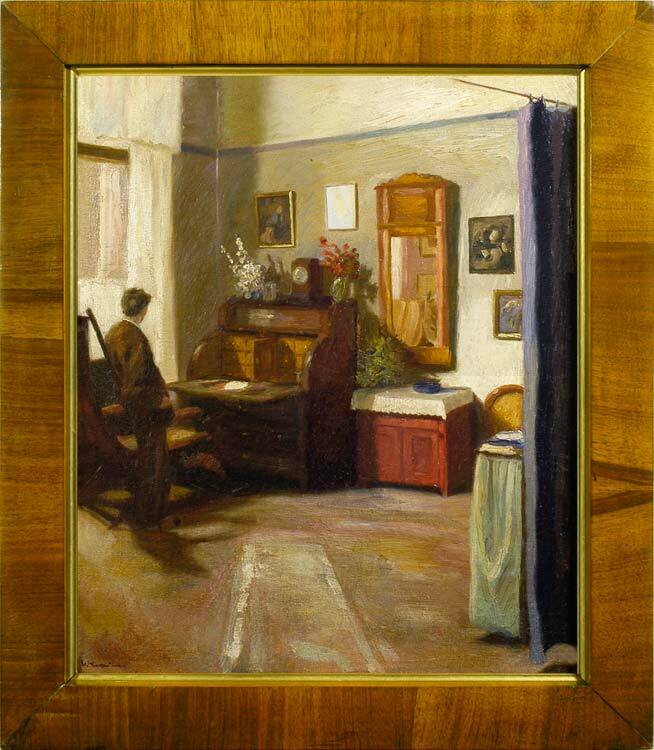 A painterly impression of a sunlit interior, this shows the corner of a study in a prosperous, middle class house; perhaps in Krain’s family home in Breslau. The composition owes something to Vermeer in its placing of a pensive figure by a window at one side. The details of the furnishings, with cloth runners, flowers and paintings, are vividly depicted, and contrast with Krain’s genre paintings of working people, or with the caricatures he produced in support of their poverty. Willibald Krain (1886-1945) was born and studied in Breslau, Germany, and then attended the Munich Academy. He worked as a caricaturist, illustrator and fine artist; much of his illustrative work was political, and was published in the major satirical and social democratic papers of the day, such as Lachen Links (1924-27) and Wahre Jakob. He was himself a socialist, and produced cartoons which attacked the suffering caused to the working classes in Weimar Germany by unemployment. He also caricatured, for example, the struggle for the minds of Germany’s children between Church, State and Army, and then began to highlight the dangers of militarism and Nazism. This resulted in his professional qualifications being withdrawn in 1933. In 1945 he was captured by the Red Army, and suffered a gunshot wound from which he died. See Peter Krain, Willibald Krain. als Künstler gefeiert – verboten – vergessen, downloadable book with illustrations by Willibald Krain.